Our Sister challenge Digi Choosday is looking for some new teamies so check out the details HERE, but be quick because the call closes this week! Closes Noon, GMT, Friday 10 March. 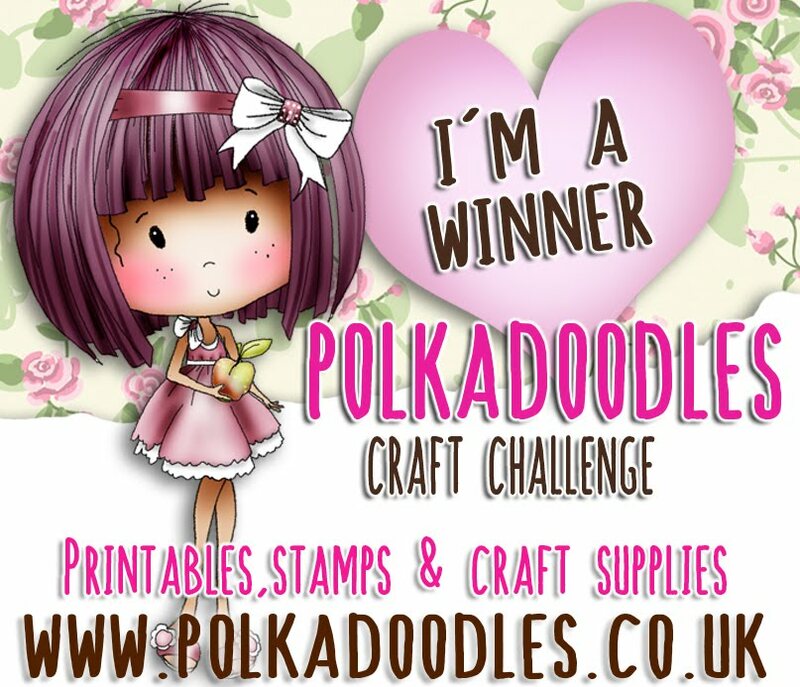 You do not need to use Polkadoodles Products to enter our challengesbut we do love seeing your fabulous creations with Polkadoodles images. 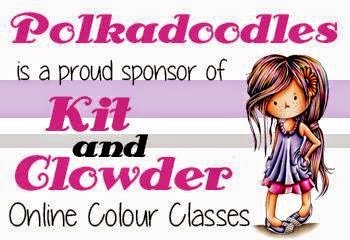 We only have a few little rules and they are over there in the side bar -------> Please remember only 2 entries per person - thank you. Pauline - I have used one of the gorgeous new Darling Buds images from The Darling Buds Big Download Bundle along with some beautiful papers from the Bella Fleur 6 x 6" Paper Pad. 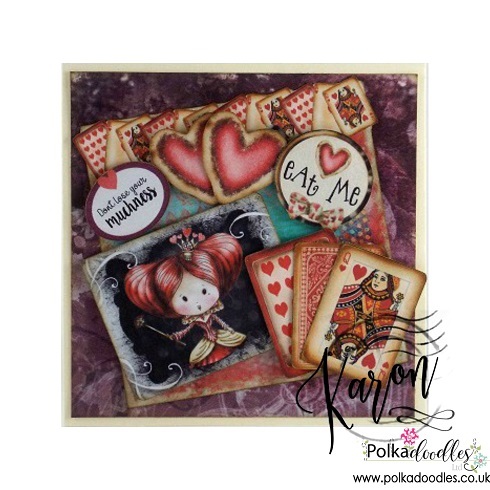 I have also used one of the Polkadoodles Elegant Nest Dies and added a sentiment that is also from The Darling Buds Big Download Bundle. Carol - Featuring the lovely Helga with a very cute ballet tutu, with some angel wings because that's what all beautiful fairy ballerinas wear. I have added lace, flowers and a pretty pink bow. Lisa - I've used the Belle Fleur Stamp Set, matching Flower Bunch doublet dies and the Belle Fleur Papers. Ruth: I've used Belle Papillion paper which I've lightly distressed plus one of the tags to create this card. 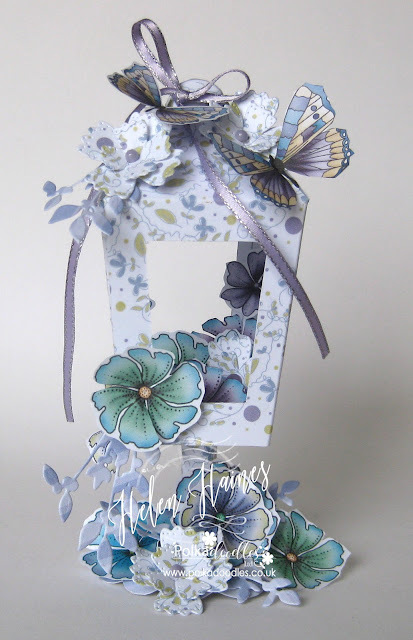 Left over from a previous project, I've added a butterfly to the bottom left corner of the tag, curing it's wings a little for added definition. The pearl heart buckle has been kicking around on my table for ever so glad to be able to use it. Waxed cord and lace from my stash. Our Winner and Top 3 of our Anything Goes Challenge Weeks 6/7 will be announced next Friday. Closes Noon, GMT, Friday 24th February. 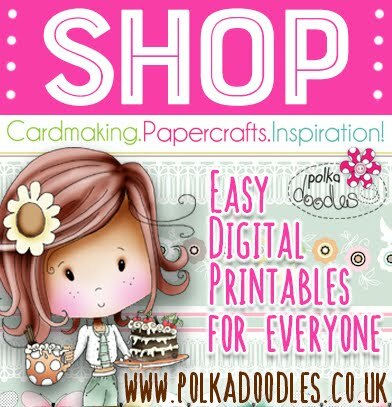 Winner will receive $10 download voucher for the Polkadoodles Digi Store. 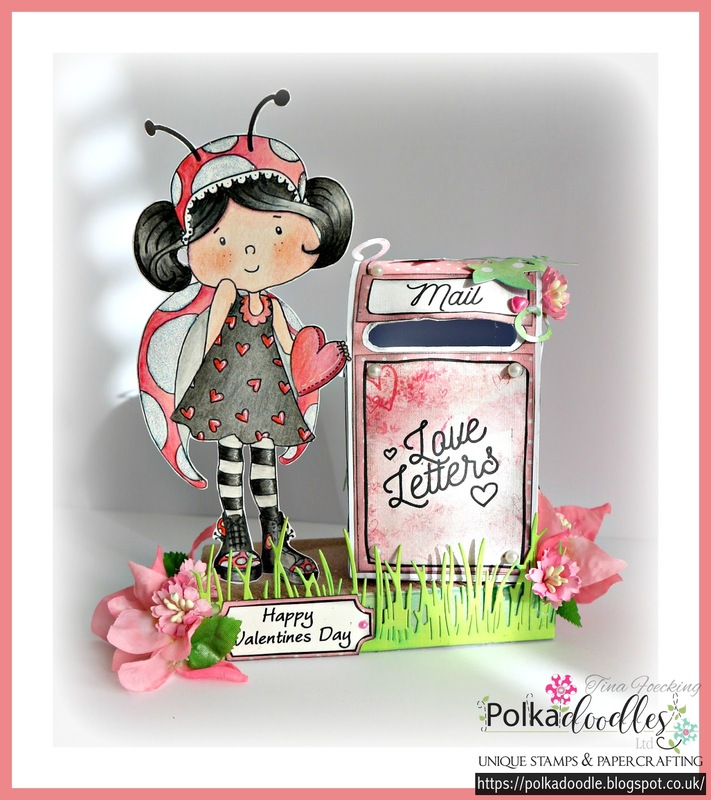 Tina:Today I would like to show you a little love letter box. 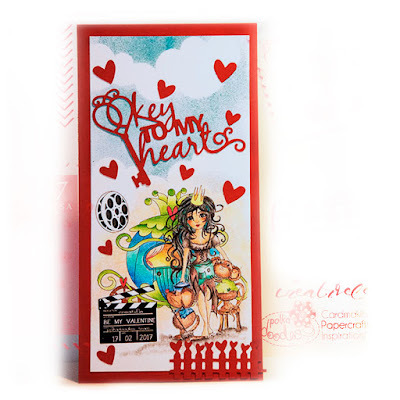 Fits for Valentine's Day and for your Inspiration. 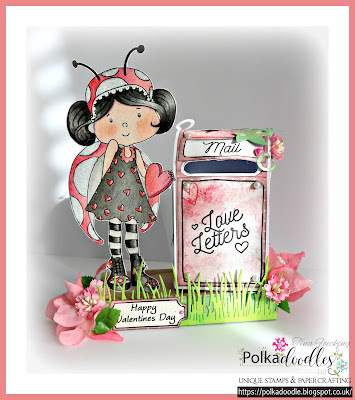 I have cut the letter box with Cameo and used some Design Paper and flowers for the decoration. 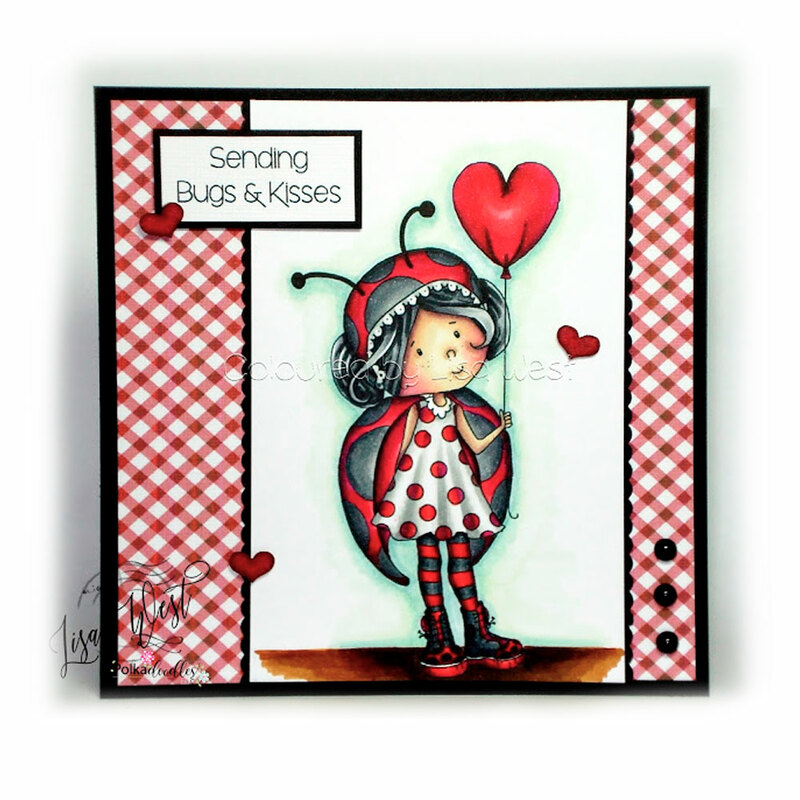 I used the sweet "Lily Bug Love - Hello from the Heart" and colored her with Polychromos. Anjie - I printed the Love word from the Lily Bug Love collection at 9cm wide onto glossy photo paper and fussy cut it out. The heart was also on the same paper. 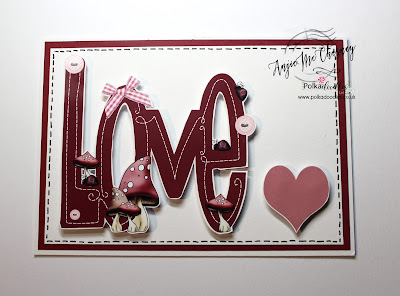 I then did some matting and layering and added some faux stitching before adding the word and heart onto 3D foam. 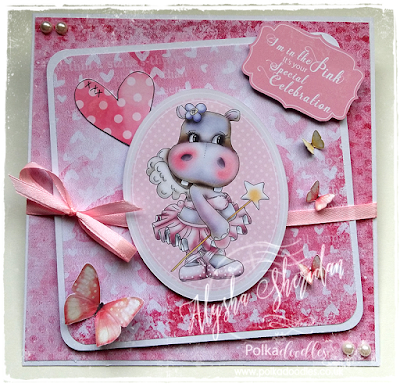 More details and another card (I couldn't resist) are on my blog. 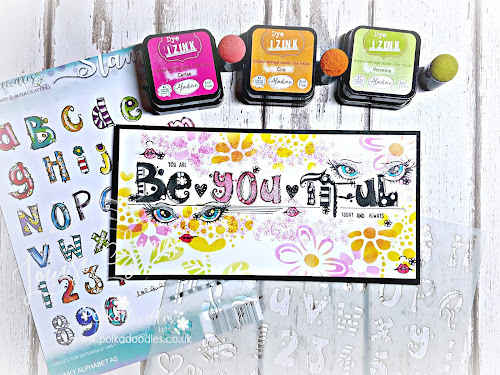 Bev here with my inspiration using Love & Kisses (Work & Play 9) I adore the love bird digi in this collection, so much so I coloured it up 4 times to create my own decoupage, using my Lyra Pencils. 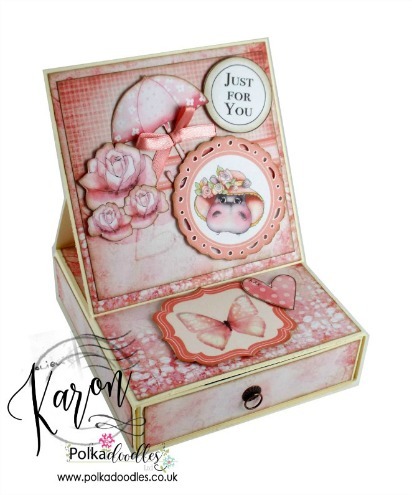 A couple of contrasting papers & the sentiment come from the collection too. 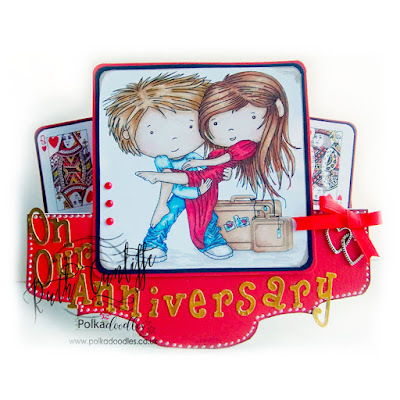 Although the decorative die cut, ribbon and a little heart embellie from my crafty stash. 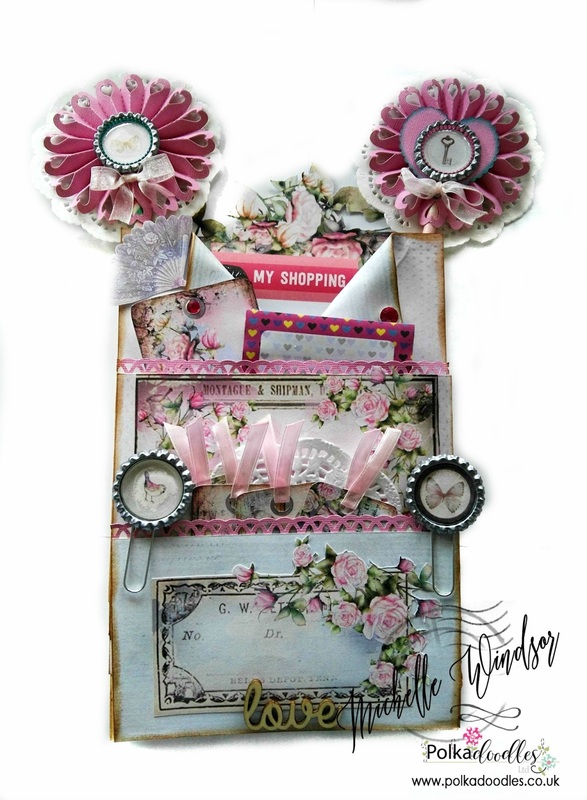 Michelle I have made a loaded envelope for this project I used Belle Papillon Big Kahuna Bundle I have made some of my own embellishments like the bottle caps with a large bottle cap, wands and tags all made with this beautiful bundle. 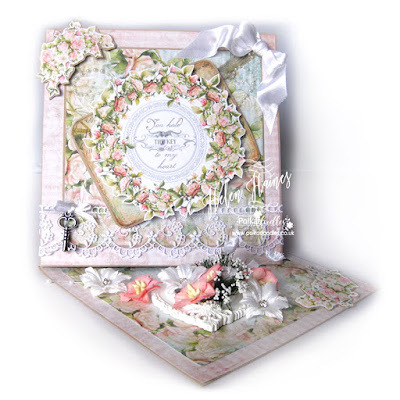 Claire C - I've used some of the beautiful papers from BellaFleur plus stamps and dies from Beau Papillon to make this card. I think this is my all time favourite paper, it's soooo pretty! 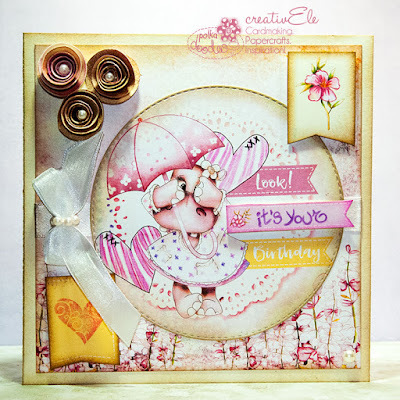 Lots of fabulous creations to inspire you! 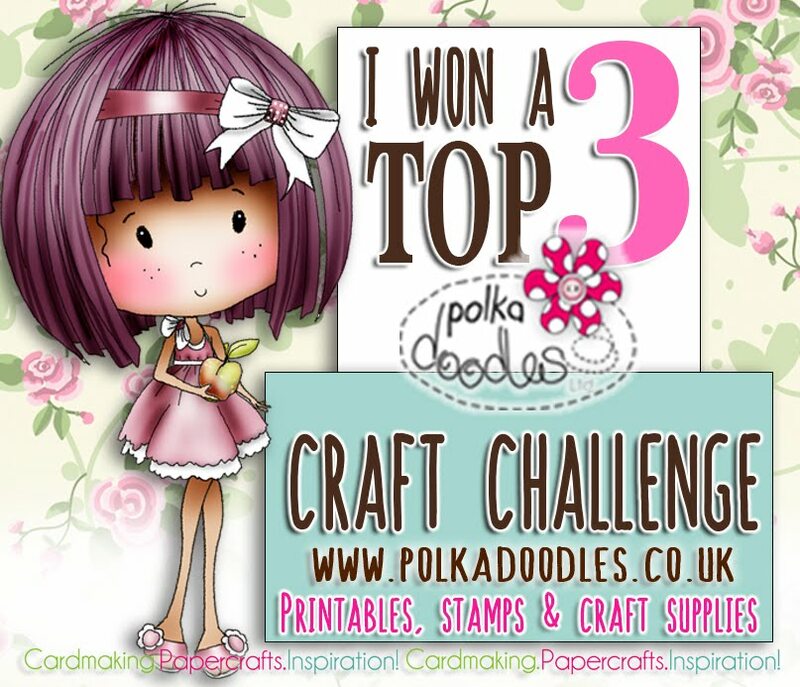 Our Winner and Top 3 of our Anything Goes Challenge Weeks 4/5 will be announced next Friday. You have until Noon, GMT, Friday 10 February to enter. 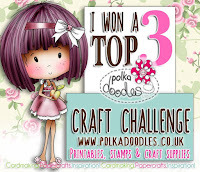 You do not need to use Polkadoodles products to enter our challenges.We only have a few little rules and they are over there in the side bar -----> Please remember only 2 entries per person - thank you. Tina: In the last week I renovated my entire craft room. Freshly painted, new floor and new furniture. Also on my desk have to be more organisation... That's why I made 2 small pencil holders in form of a book and used for Winnie Fruit Punch -Design Sheets. For the small book I used Shoes & Shopping Design Sheet. For the little bigger book, I used the Design Sheet Dance Star. 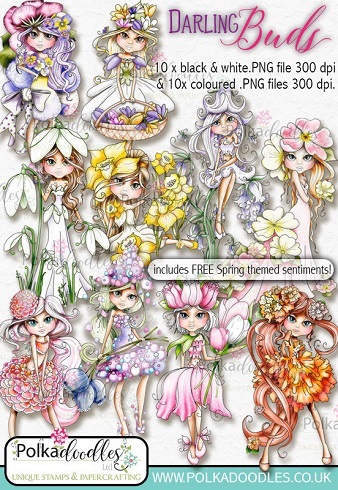 You also can find all the sweet Images, Design Sheets, Papers and much more in the Winnie Fruit Punch - Big Bundle. 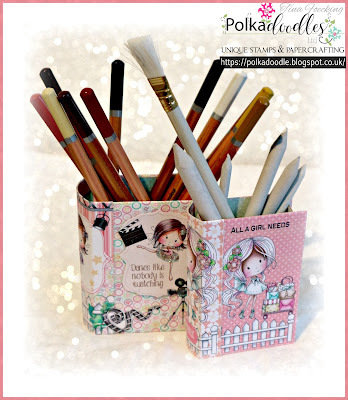 On my Blog you can find more details and photos.... have fun! 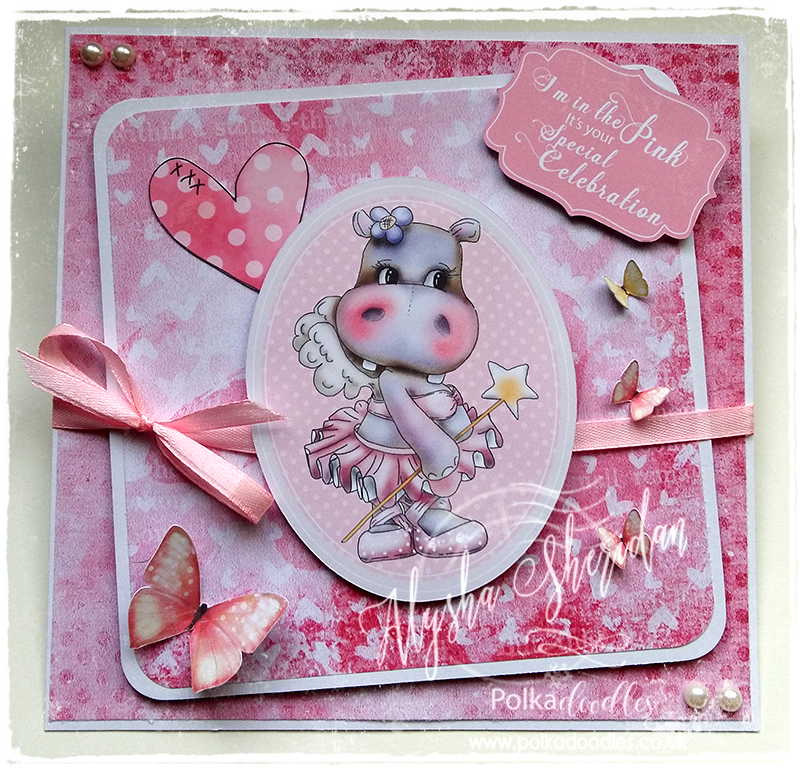 Anjie - I have used a design sheet from the new Helga Hippo collection, design sheet number 6 and here is my make. Lots more info on my blog. Michelle I have use a design sheet from the Winston Deluxe Full download this was so quick and easy to make something up for a card or a tag like mine these design sheets are fantastic for lots of things you can also just use them for embellishments. 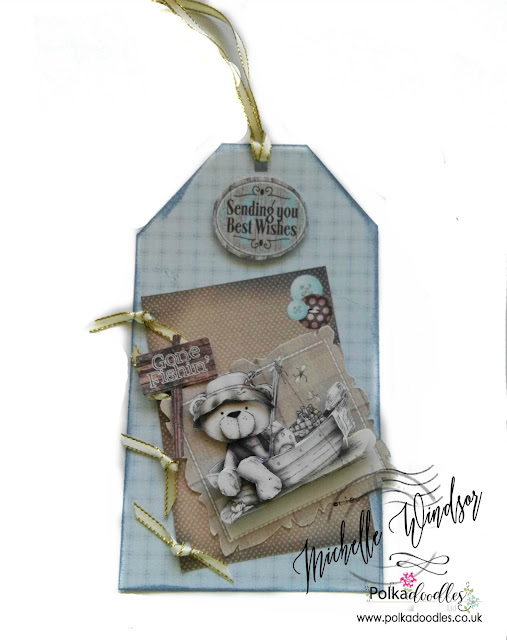 Claire C I've used one of the design sheets from Winnie in Wonderland, to make a little charm and matching tag. 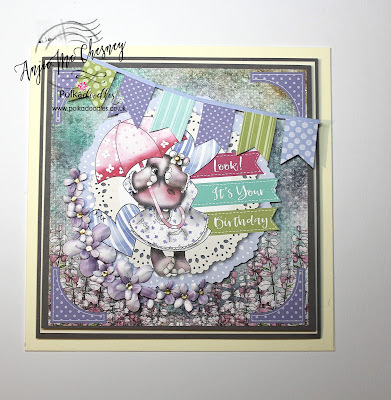 I love Winnie and it's so quick to make a project using the design sheets. I've used Design Sheet 2 which you can find here or you can find the full collection here. 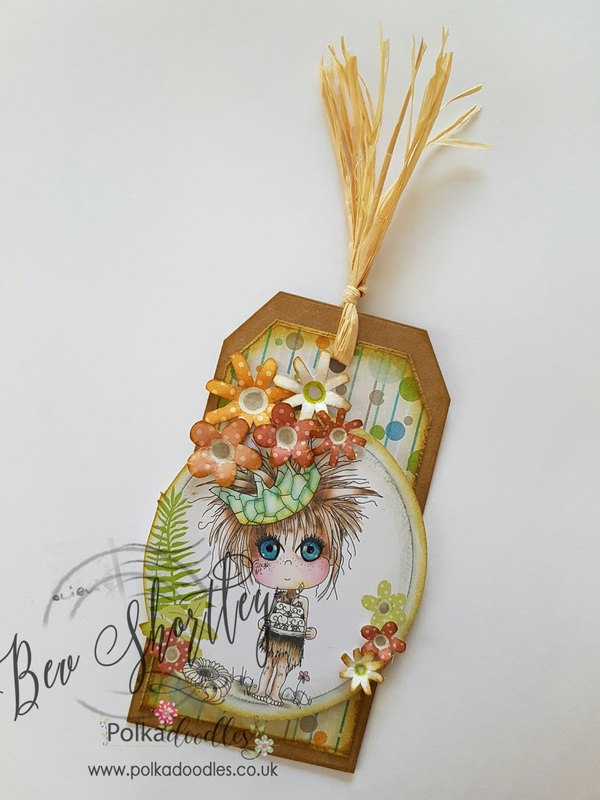 Scatty Jan For my project this week I have made a little gift bag, I have used the new collection Helga and I have decorated using the design sheet 1 . I have also used one of the tags from the collection. Bev here with a cute little tag made from Design Sheet 1 from Sticks & Bones. when you still want to craft and have very little time these design sheets make life so much easier. 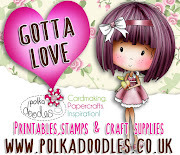 All I used from my crafty stash was my card base, a glitter pen, glossy accents, distress ink and raffia. Congratulations to everyone. We thank you all for taking part in our challenges, we love coming to visit and seeing all your wonderful creations.